While clouds are bright, aerosols reflect little to the top of the atmosphere where satellites measure. Molecular scattering, ice and desert cover, and land surface reflectance all complicate the retrieval of aerosol properties from this vantage point. Aerosol are also well-known cloud condensation and/or ice nuclei, and their presence in a moist environment can drastically impact the extent of cloud or ice crystal growth, compared to a clean, unpolluted scene. Radiometric satellites, with global coverage, wide spectral range, and long lifetime in space, advance the way we attack this problem. Strides made in the past two decades in data interpretation produced new ways to understand the atmosphere by comparing the signal from two different wavelengths. Information about the same scene, viewed from different perspectives, helps constrain how well we perceive the distribution and thickness of aerosol over land and ocean. From 1999 onward, advancements in sampling both the intensity and orientation (or polarization) of light revealed differences in the scattering properties between ice and liquid water, improving radiometric estimates of cloud phase. Several studies converge on the idea that a multi-angle imaging polarimeter, with high accuracy and narrow spatial and angular resolution, is the strongest candidate to sample cloud and aerosol properties at the level required for climate study. The Hyper-Angular Rainbow Polarimeter (HARP) is a wide field-of-view camera, designed and developed by J. Vanderlei Martins and the Laboratory for Aerosol and Cloud Optics (LACO) Group at UMBC, to fill this role. HARP images the intensity and polarization of reflected sunlight from clouds, aerosol particles, land, and ocean. Polarization encodes small-scale information about cloud droplet size and distribution, refractive index, particle sphericity, and optical depth beyond and complementary to what current satellites can measure. Flying HARP in tandem with current satellites improves the ability of those instruments to characterize the atmosphere; this is further emphasized by HARP’s versatile CubeSat size and seamless integration on a variety of research aircraft. Over the past year, AirHARP, a HARP instrument adapted for aircraft, flew on two NASA research campaigns: the Lake Michigan Ozone Study (LMOS) and the Aerosol Characterization from Polarimeter and LIDAR (ACEPOL). The LMOS campaign was a joint NASA-NOAA-EPA effort to explore the connection between lake breezes and high ozone exceedance levels on the eastern coastline of Wisconsin in the summer months. AirHARP took data on many B-200 flights alongside the NASA LaRC GeoTASO instrument, a trace gas experiment that measures ozone pre-cursors, such as NO2, through the entire atmospheric column. Brent McBride, a Ph.D candidate in Martins’ group, operated AirHARP on-board the B-200 and led field operations on the ground throughout the campaign, while LACO group members engaged remotely from UMBC. While AirHARP does not have trace gas sensitivity, measurements of convective clouds and low aerosol levels over eastern Wisconsin will be compared to co-incident observations made by AERONET sun photometer sites and the Advanced Baseline Imager (ABI) on the GOES-R geosynchronous satellite. 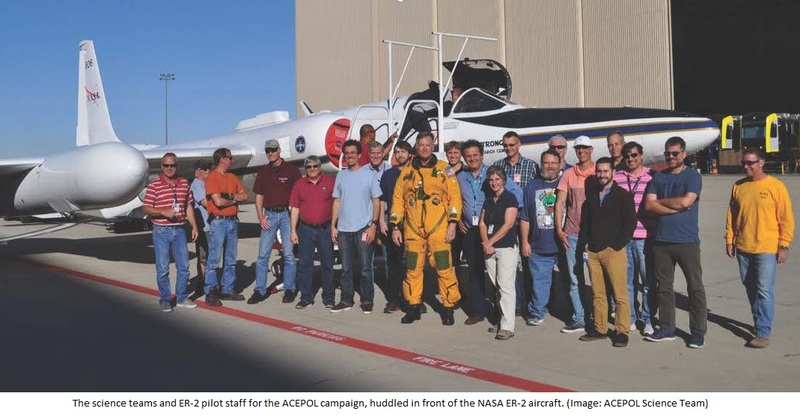 AirHARP’s role during ACEPOL was more prominent, as three other polarimeters and two LIDAR instruments on the NASA ER-2 took co-incident measurements for inter-validation over Southern California and the Pacific Ocean. This region is popular for polarimeter experiments due to the many California AERONET sites for ground validation, stable marine stratocumulous clouds for calibration, and high wildfire smoke potential. LIDAR instrumentation was included as part of ACEPOL to better capture the vertical extent of aerosol, juxtaposed with the spatial coverage provided by the polarimeters. One of the instruments, AirSPEX from Netherlands Institute for Space Research (SRON), is an airborne prototype of the SPEXone polarimeter that will fly on-board the Plankton-Aerosol-Clouds-ocean Ecosystem (PACE) mission alongside a heavily modified version of AirHARP, HARP-2, in the 2020s. The ACEPOL mission served as their first joint venture and data analysis is underway to assess how well SPEXone, AirHARP, and the other polarimeter and LIDAR instruments observe the same scenes. This effort is particularly important for preparation of the upcoming 2018 launch of the HARP CubeSat satellite instrument to the ISS orbit. The CubeSat is a stand-alone payload with a mission lifetime of one year. Martins and McBride form the leading science team for the analysis of HARP instrument datasets from these two aircraft campaigns and beyond. The LACO team hopes to continue participating on future exploratory missions like ACEPOL, to increase the visibility and utility of polarized remote sensing measurements. The LACO team is analyzing AirHARP datasets to (1) infer surface and ocean properties, (2) retrieve cloud and aerosol microphysics (cloud droplet effective radius, variance, refractive index, cloud thermodynamic phase, AOD, and particle size distributions, (3) validate and compliment assumption-limited retrievals from radiometers, and (4) help extend retrievals from vertically-resolved LIDAR instruments. The versatility of the HARP instrument suite, in both science output and physical size, provides an attractive platform to explore the toughest questions about how clouds and aerosols interact and their impact on climate evolution.